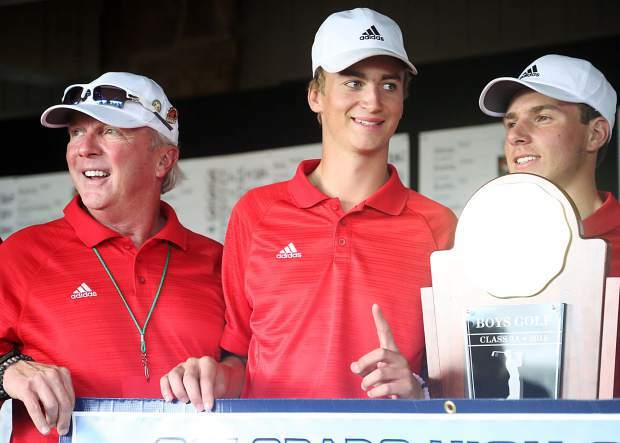 From left, assistant coach Don Buchholz, senior Dominic Lanese and junior Jack Pevny celebrate after winning the Class 3A state golf tournament on Tuesday, Oct. 2, 2018 at Boulder Country Club. 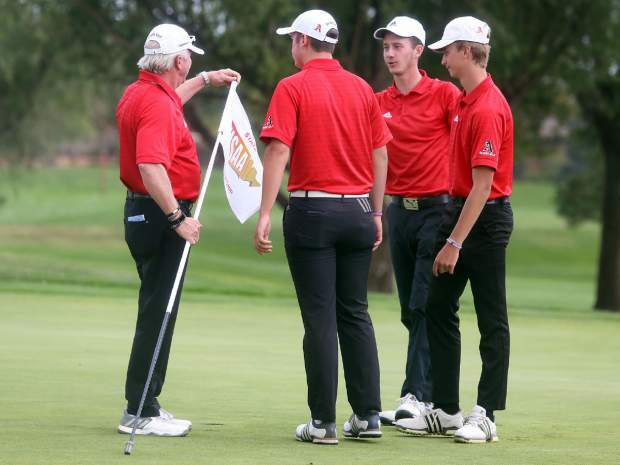 Aspen assistant coach Don Buchholz helps players commandeer the 18th green flag after winning the Class 3A state golf tournament on Tuesday, Oct. 2, 2018 at Boulder Country Club. 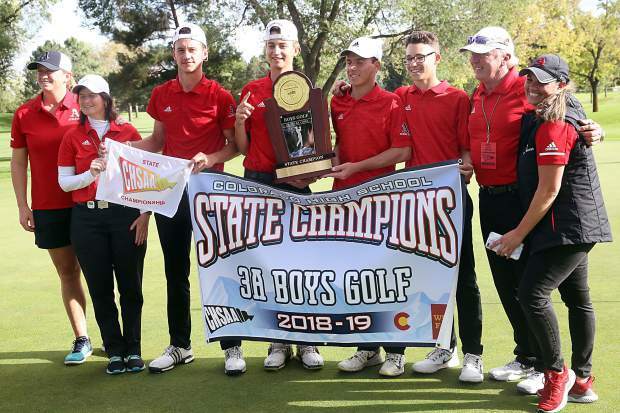 The Aspen High School boys golf team won the 2018 Class 3A state golf tournament on Tuesday, Oct. 2, 2018 at Boulder Country Club. 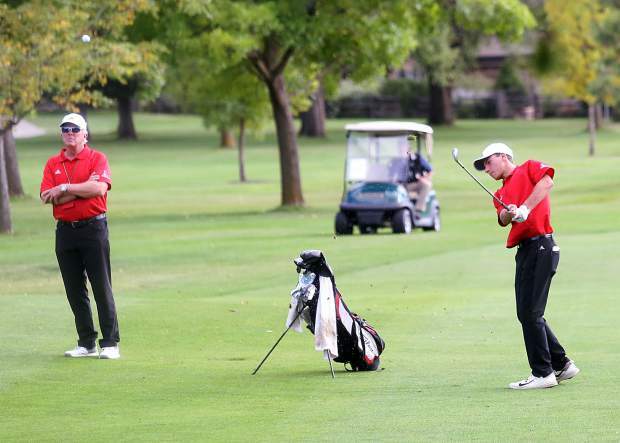 Aspen junior Jack Pevny hits his approach shot on the 18th hole as assistant coach Don Buchholz watches in the Class 3A state golf tournament on Tuesday, Oct. 2, 2018 at Boulder Country Club. 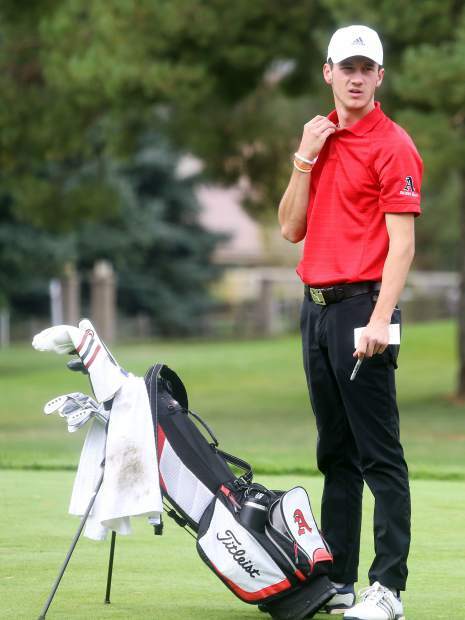 Aspen senior Dawson Holmes awaits the start of the second round of the Class 3A state golf tournament on Tuesday, Oct. 2, 2018 at Boulder Country Club. 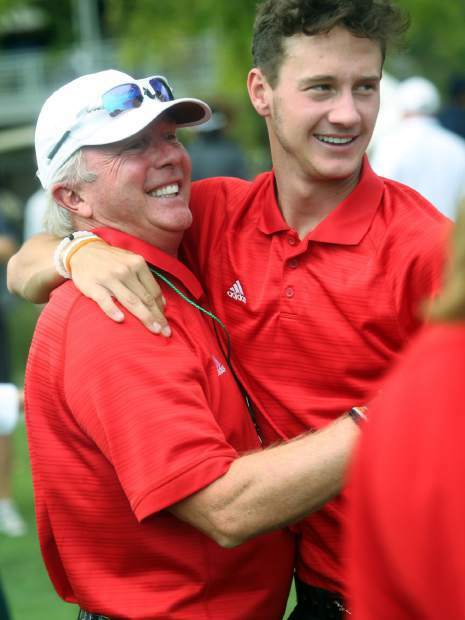 Aspen senior Dawson Holmes, right, hugs assistant coach Don Buchholz after winning the Class 3A state golf tournament on Tuesday, Oct. 2, 2018 at Boulder Country Club. 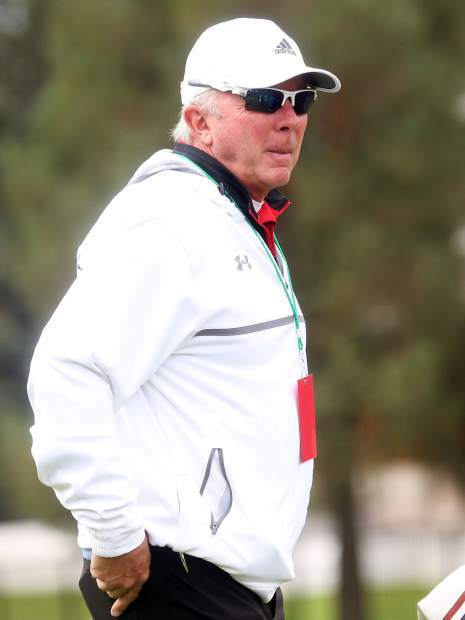 Aspen assistant golf coach Don Buchholz awaits the start of the second round of the Class 3A state golf tournament on Tuesday, Oct. 2, 2018 at Boulder Country Club. 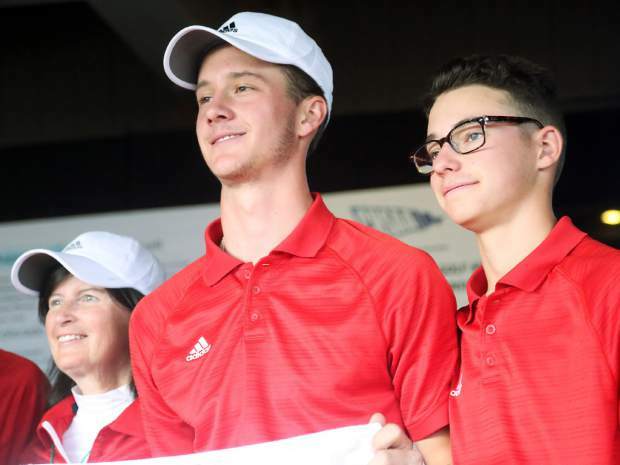 Aspen seniors Dawson Holmes, left, and Jack Hughes pose with the banner after winning the Class 3A state golf tournament on Tuesday, Oct. 2, 2018 at Boulder Country Club. 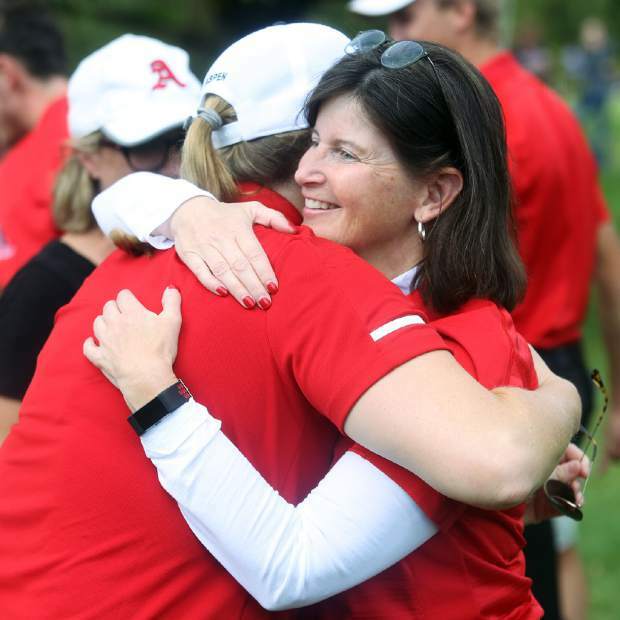 Aspen High School boys golf coach Mary Woulfe, right, hugs AHS athletic director Martha Richards after winning the Class 3A state golf tournament on Tuesday, Oct. 2, 2018 at Boulder Country Club. 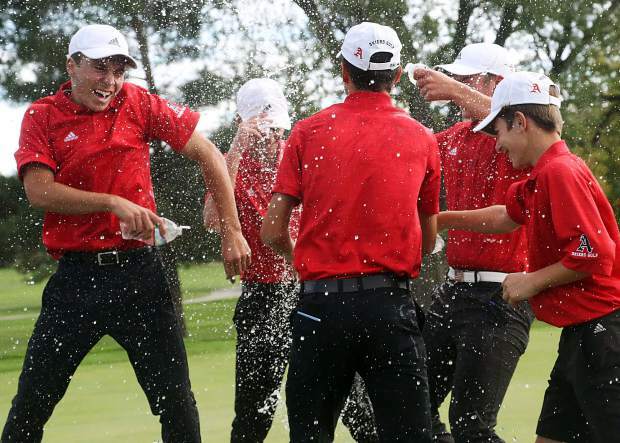 The Aspen High School boys golf team celebrates by spraying each other with water after winning the Class 3A state golf tournament on Tuesday, Oct. 2, 2018 at Boulder Country Club. 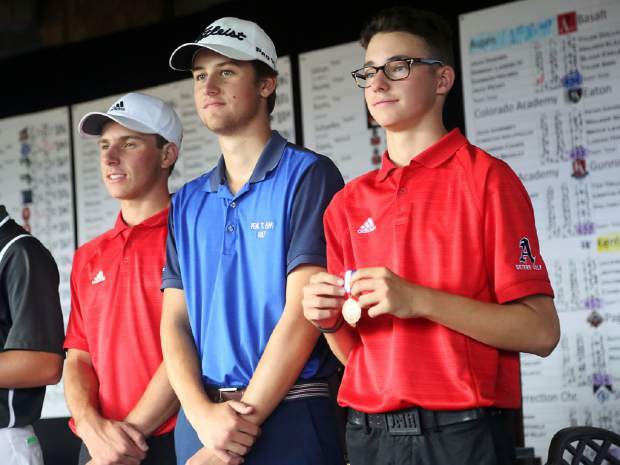 Aspen senior Jack Hughes, right, and AHS junior Jack Pevny, left, stand with Peak to Peak's Davis Long after finishing 2-4 in the Class 3A state golf tournament on Tuesday, Oct. 2, 2018 at Boulder Country Club. 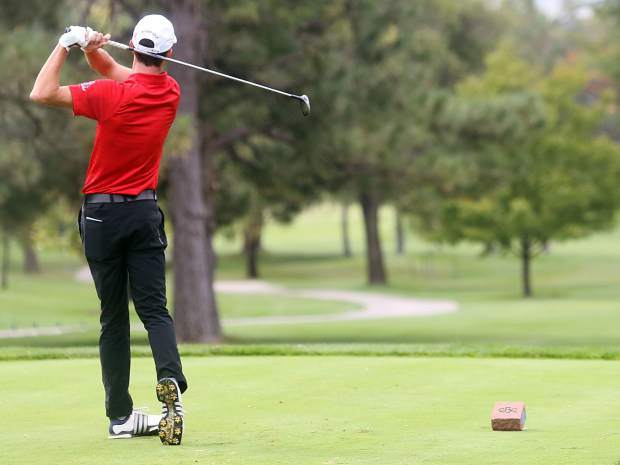 Class 3A state golf tournament on Tuesday, Oct. 2, 2018 at Boulder Country Club. 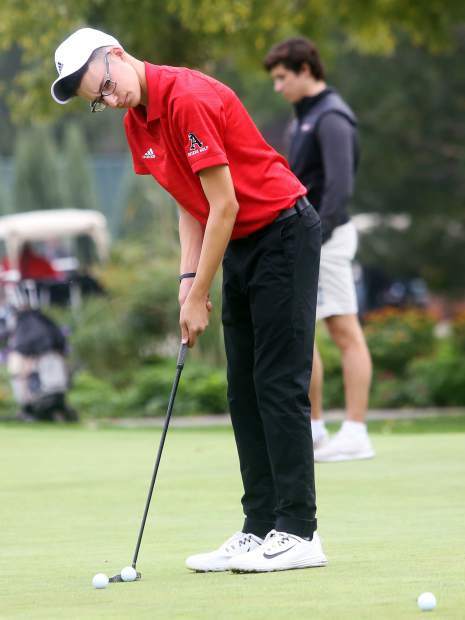 Aspen junior Jack Pevny watches his ball after teeing off from the first hole of the second round of the Class 3A state golf tournament on Tuesday, Oct. 2, 2018 at Boulder Country Club. Aspen junior Jack Pevny walks away with the championship trophy after the Skiers won the Class 3A state golf tournament on Tuesday, Oct. 2, 2018 at Boulder Country Club. Aspen senior Dawson Holmes tees off from the first hole in the second round of the Class 3A state golf tournament on Tuesday, Oct. 2, 2018 at Boulder Country Club. 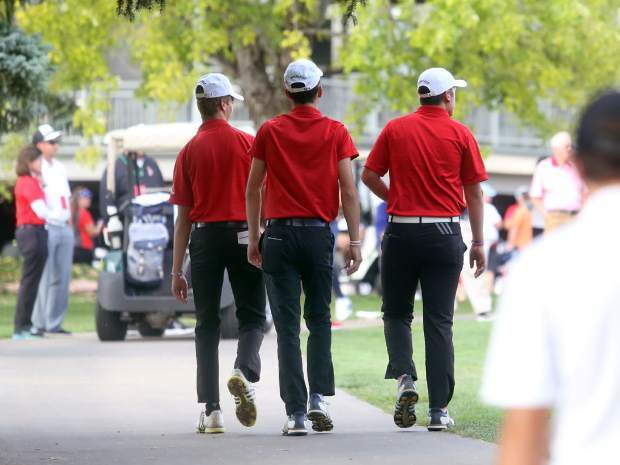 Aspen High School golfers, from left, Dominic Lanese, Dawson Holmes and Colter Zwieg walk back toward the clubhouse during the Class 3A state golf tournament on Tuesday, Oct. 2, 2018 at Boulder Country Club. 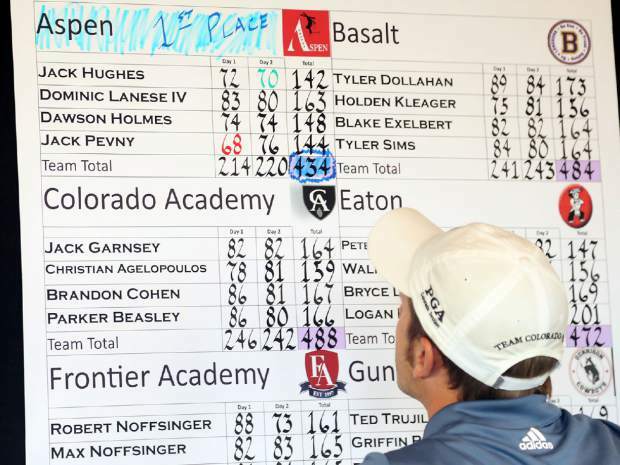 Offiicals post the final scores at the Class 3A state golf tournament on Tuesday, Oct. 2, 2018 at Boulder Country Club. 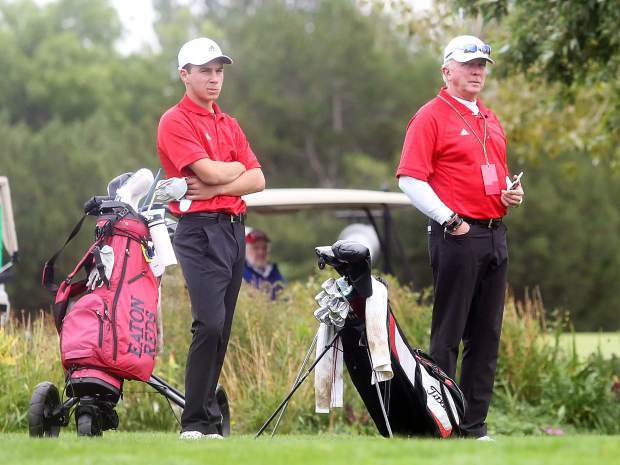 Aspen junior Jack Pevny, left, and assistant coach Don Buchholz await the start of the second round of the Class 3A state golf tournament on Tuesday, Oct. 2, 2018 at Boulder Country Club. 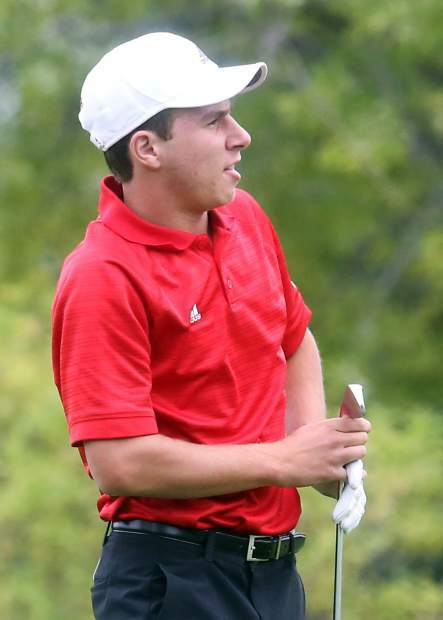 Aspen senior Dominic Lanese hits onto the ninth green during the second round of the Class 3A state golf tournament on Tuesday, Oct. 2, 2018 at Boulder Country Club. Aspen High School senior Dawson Holmes practices on the putting green ahead of the second round of the Class 3A state golf tournament on Tuesday, Oct. 2, 2018 at Boulder Country Club. 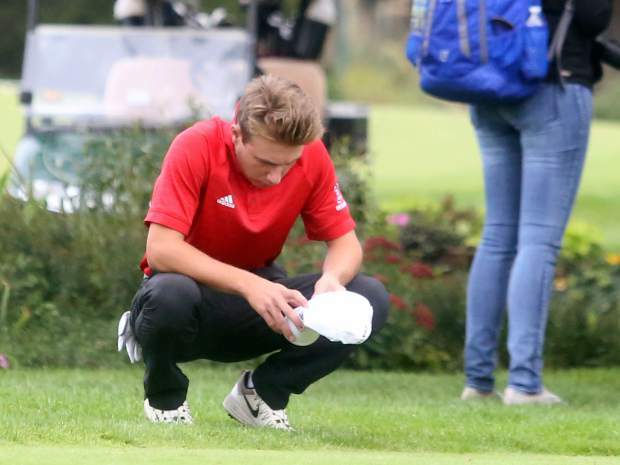 Aspen junior Jack Pevny collects himself before beginning the second round of the Class 3A state golf tournament on Tuesday, Oct. 2, 2018 at Boulder Country Club. 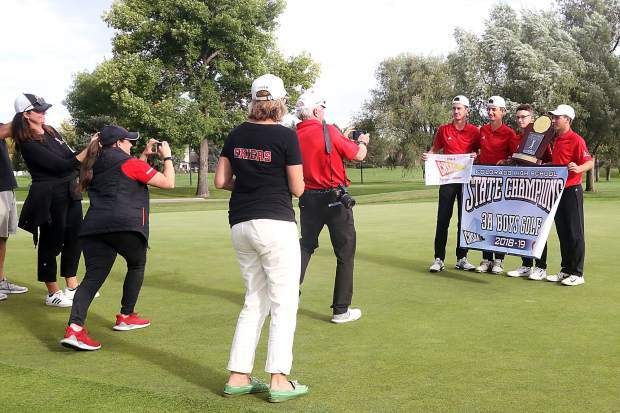 Eaton's Peter Grossenbacher, right, who led after Round 1, walks off the 18th green as the Aspen High School boys golf team celebrates winning the Class 3A state golf tournament on Tuesday, Oct. 2, 2018 at Boulder Country Club. Aspen junior Jack Pevny tees off from the first hole of the second round of the Class 3A state golf tournament on Tuesday, Oct. 2, 2018 at Boulder Country Club. 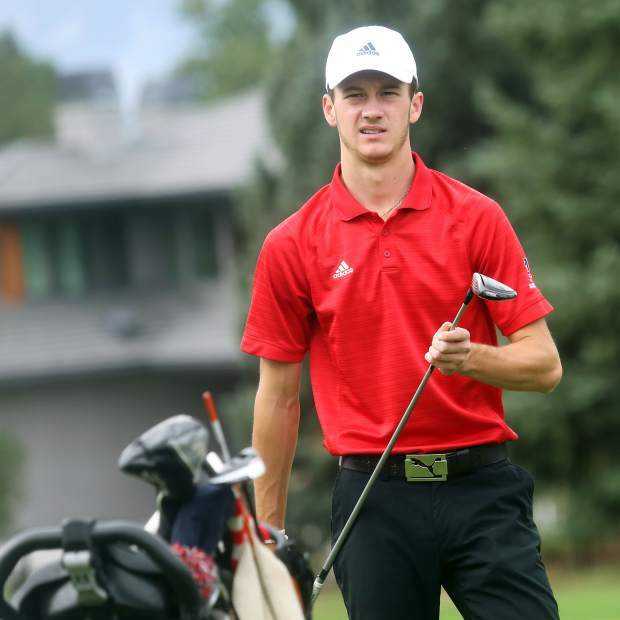 Aspen senior Dawson Holmes gets ready to tee off in the second round of the Class 3A state golf tournament on Tuesday, Oct. 2, 2018 at Boulder Country Club. 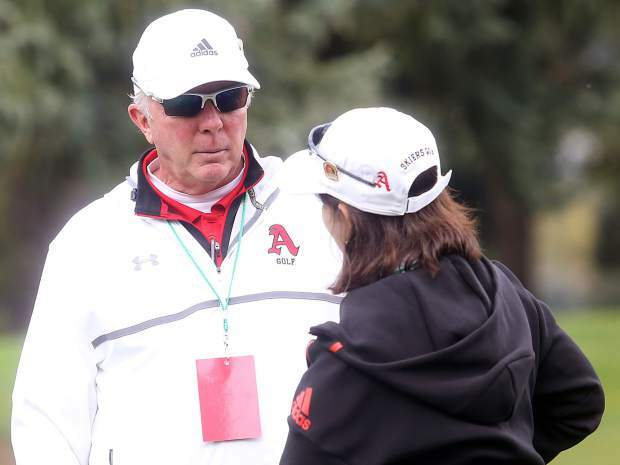 Aspen golf coaches Don Buchholz, left, and Mary Woulfe chat before the start of the second round of the Class 3A state golf tournament on Tuesday, Oct. 2, 2018 at Boulder Country Club. 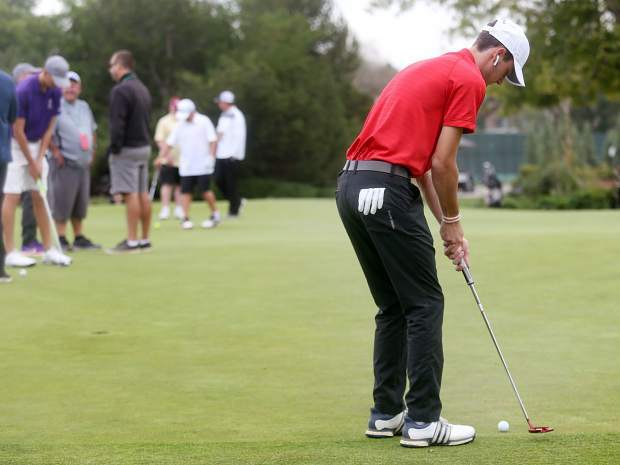 Aspen senior Jack Hughes practices on the putting green ahead of the second round of the Class 3A state golf tournament on Tuesday, Oct. 2, 2018 at Boulder Country Club. BOULDER — Jack Pevny wanted to know the score. Don Buchholz wasn’t going to clue him in. 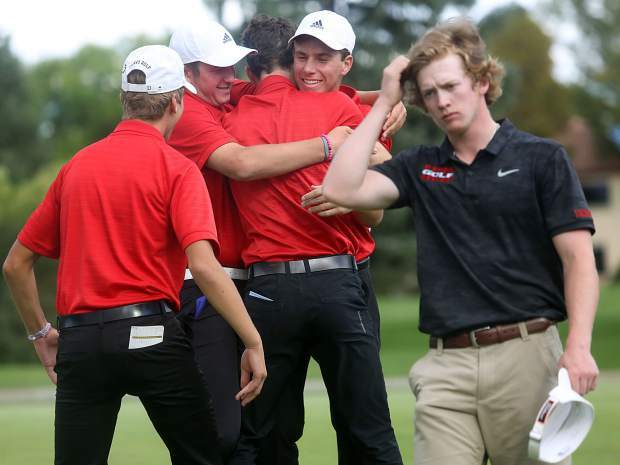 Maybe this was cruel, but there was a lot on the line for the Aspen High School boys golf team. At least, the idea was to make sure Pevny believed his final few shots were crucial. In the end, Pevny’s final putt didn’t mean much. Sure, it secured him a fourth-place finish and all-state honors, but he had plenty of room for error as far as the team standings were concerned. 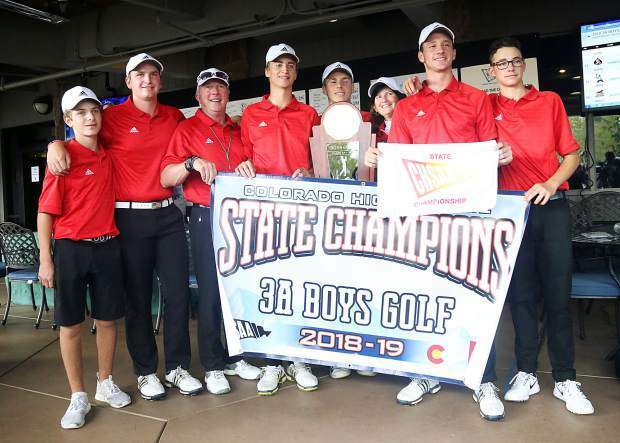 Leading by only a stroke over Kent Denver after the first day, the Skiers rolled to a nine-stroke win over the Sun Devils, who were looking for a state record 10th championship in boys golf. 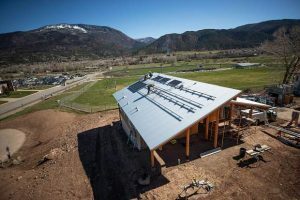 Instead, Aspen shut down that possibility to finally get their first. The Skiers had been close before, finishing second as recently as 2011 (to Kent Denver, of all teams), but it took this particular group to get over that hump. While the race for the team title was never close down the stretch, the individual title was neck-and-neck the entire way. Near the turn, five players were tied with the lead, with Pevny among the leaders from the start. 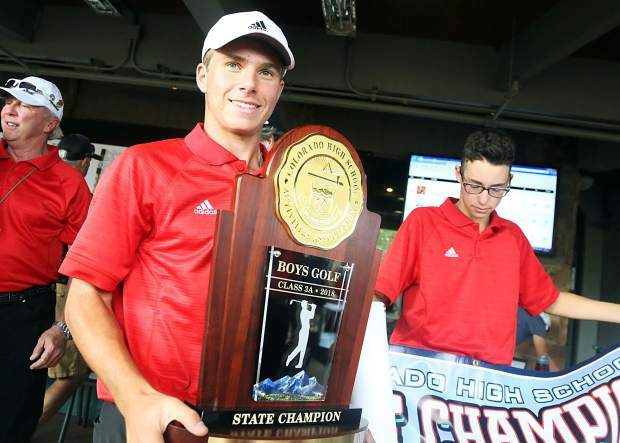 Kent Denver’s Jackson Klutznick ended up taking top honors after knocking in three straight birdies on the back nine to finish the tournament at 1-under. 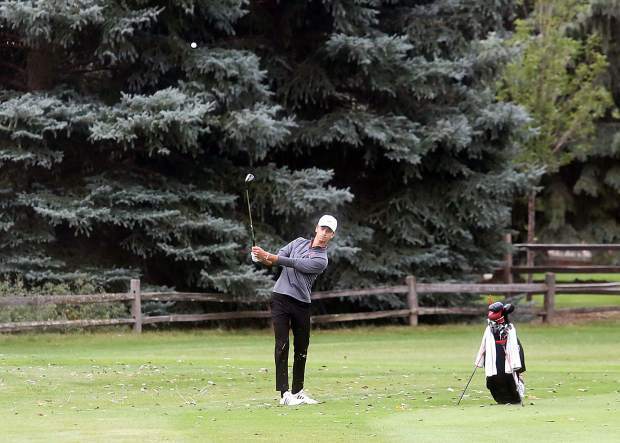 Aspen senior Jack Hughes, who is committed to play for the University of Colorado, ended up second at 2-over (72-70). Peak to Peak’s Davis Long, the 2017 3A state champion, finished third at 3-over, with Pevny (68-76) and Prospect Ridge’s Walker Franklin (71-73) both shooting 4-over on the par 70 course. 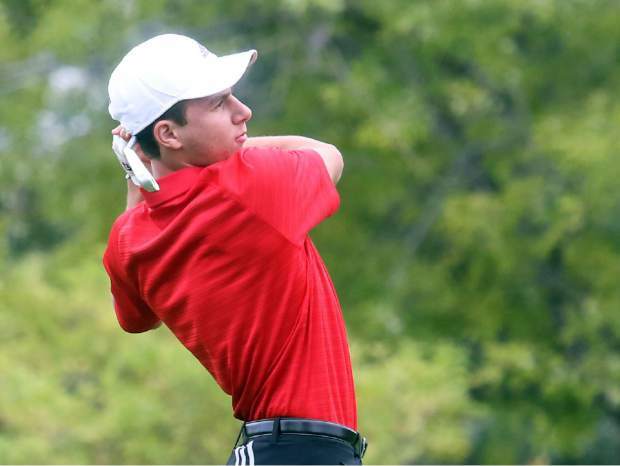 Eaton’s Peter Grossenbacher, who shot 65 on Monday and had the lead after Round 1, fell apart after a double bogey on the second hole Monday to shoot 82 for the round and finish in a tie for 10th overall. Aspen finished 14-over as a team, while Kent Denver was 23-over. Holy Family was third at 37-over, while Basalt was sixth at 64-over. 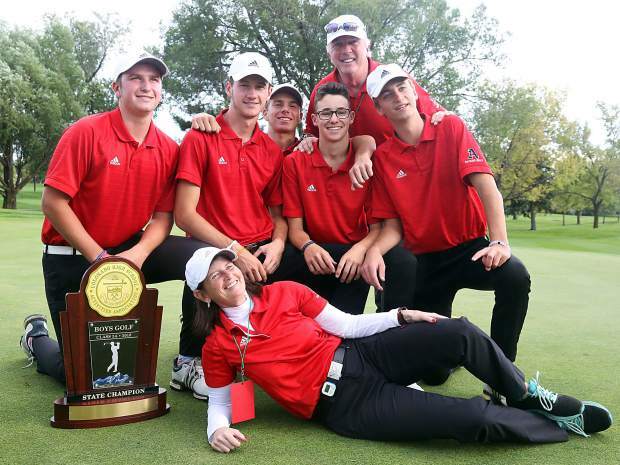 Hughes said one of his favorite memories of playing golf for Aspen was watching Will Hazen tie for second at state when Hughes was a freshman. To see it come full circle by taking second as well was as good as it gets for the future Buff. Senior Dawson Holmes rounded out the scoring for the Skiers, finishing 8-over (74-74) to come in 13th place. Fellow senior Dominic Lanese, one of the team’s better golfers all season, struggled both days. He finished 32nd at 23-over. Pevny was in third after Round 1 and played in the final grouping Tuesday, but couldn’t keep pace with Klutznick, who only shot 2-over in that second round. Still, Woulfe said it was Pevny’s early play Tuesday that got in the head of players like Grossenbacher and paved the way for Aspen’s team victory.